It has been years since I have used Filemaker and while conducting a web search on running reports in FMP, I came across your site. Would you please refresh my memory - how do I run a report for specified dates? For example, I'd like to find out which contacts were active during 2007. Basically, you want to use the range operator, that can be found in the status area while you are in Find mode. 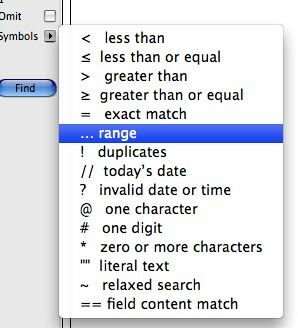 You can do a special find operation in FileMaker to return anything between two specified dates in a date field. To do this, go to find mode, click in the date field, type in beginning date, then type in 3 period characters ( ... ) and then type in the ending date. This will bring up a found set of records between those entered dates in the date field you searched. Here you can see the search options in the status area in Find mode and the selected range symbol.